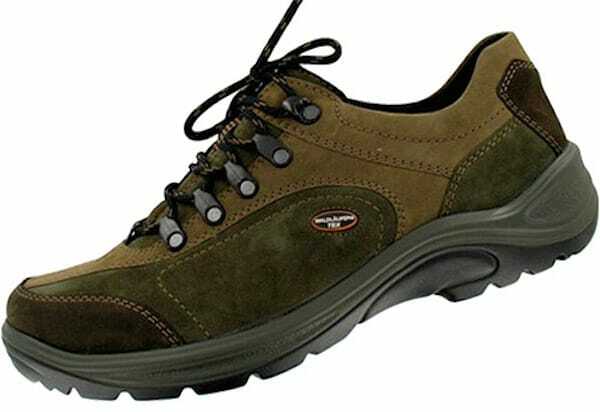 If you are looking for travel shoes for men over 50, the Waldlaufer Tex Jack is a great choice. Admittedly, when it comes to finding comfortable walking shoes for travel, I’m jealous of my husband. He rarely has the foot problems I do. And I’m sure I’m not alone because my female friends commiserate with me. My closet is filled with an embarrassing abundance of almost-new shoes that are too uncomfortable to wear. When I asked my husband to “test drive” a pair of shoes that promised “relief from foot pain,” offered to us for review from the European comfort shoe brand Waldlaufer (which means Forest Walker in German), he was initially less than enthusiastic. Like most men he was happy with what he had. Then he gave the Tex Jack Model of Waldlaufer orthopedic shoes a “test run” and appreciated why these make an excellent choice of travel shoes for men over 50. When we travel, we tend to do more walking than we do at home, often over uneven ground (think San Miguel de Allende). Shoes that are ordinarily comfortable for an hour or two may reveal their pressure points after a full day’s wear. The Waldlaufer shoes took no “breaking in” because they were soft, supple and breathable, with an air-cushioned sole that felt comfortable on long walks from the get-go. They were also true to size. The one minor drawback my husband reported was that the toe box wasn’t as padded as he was used to. However, the shoe’s massaging cork footbed is removable in the event that you want to insert orthopedic inlays to address specific foot problems. I’m usually the arbiter when it comes to my husband’s shoe fashions. Tex Jack came in a high-quality leather in a neutral color that was versatile enough to wear on a hike at Big Sur or a city stroll in Paris. This is a big plus, because having to bring along an extra pair of shoes or two on a trip can really add significant bulk and weight to a suitcase. Moreover, the shoes offered good support but were super-light. The shoes are made with a breathable membrane that is water-resistant so that rain or snow can’t penetrate the high-quality leather uppers. This layer also protects against cold and wetness. Thus, the all-season shoe fits our lifestyle, which often includes travel to diverse climates. He has worn them for several weeks and they look good as new. They have nice hook and loop fasteners, and high-quality laces. He also appreciates being able to slip in and out of them easily without having to untie them. Waldlaufer shoes, which are also made for women, are available across many continents, including North America. The website offers a list of retailers searchable by country. Disclosure: Although we received a pair of these shoes for review, all opinions expressed in this post are our own.